IJM Land Bhd will commence work for its RM5bil commercial precinct next to the Penang Bridge in the second half of next year. 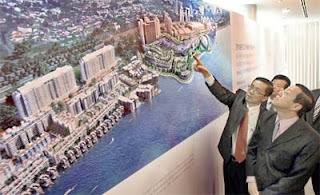 Its chief executive officer Datuk Soam Heng Choon said the commercial precinct located on a 102-acre site would comprise four hotels, a shopping centre, a convention centre, and an international business district. The commercial precinct would be developed in stages and would take seven to eight years to complete, Soam said. He spoke after signing an agreement with Singapore's Suntec International to jointly develop the convention centre, known as the RM346mil Penang Waterfront Convention Centre (PWCC). Also present was Suntec Penang chief executive officer Arun Madhok, who signed for Suntec, and IJM Corp chief executive officer Datuk Teh Kean Ming. Penang Chief Minister Lim Guan Eng was present to witness the signing ceremony. Soam said the PWCC was designed by Larry Oltmanns, design director of Vx3, a London-based architectural firm specialising in large scale urban developments and convention centres. “His impressive portfolio includes landmarks such as NATO headquarters in Brussels and Hong Kong Convention Centre in Victoria Harbour,” Soam added. The highlight of the convention centre was a 10,000 sq m column-free multi-purpose hall that could be divided or used as a single space for exhibitions, conventions, corporate events, and private functions, Soam said. “It can be converted into a 9,000-seat arena for world-class concerts that can be held in Penang for the first time. “The PWCC is expected to be completed in early 2017,” he added. Meanwhile, Teh said the PWCC would serve as an alternative to renowned convention venues in places such as Kuala Lumpur, Bangkok, Singapore, and Hong Kong. “The strategic partnership with Suntec will further attract higher investments and spur Penang's economic, social, and environmental development,” Teh added. On PWCC, Madhok said Suntec would advise on the design and functionality of PWCC.